In modern launchers, two tanks are used, one for fuel and one for the oxidizer, but it has not always been the case. 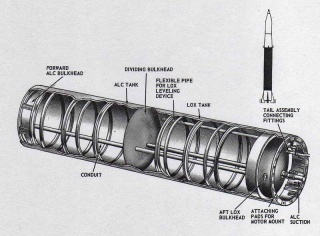 The Redstone rocket for example used a single tank with an internal separation, as we can see below. The sphere is the most lightweight volume (volume / area is minimized), but we can't have rockets as large as they are long, so cylinders with hemispheric caps are used. Having a single tank cut in two like for the Restone is efficient mass-wise and volume-wise but can bring new issues for insulation in case of a single cryogenic fluid (funny enough, that was the case for the Restone which used LOX and ethanol). The thicker insulation may overtake the mass benefits of a single tank. Special care must be taken to avoid sloshing and vortexes in the tanks, that may lead to bubbles in propellant flow. Tank material first has to be stable with what's inside. Lists are available for cryogenic liquids at least. Besides this basic filter, the material choice mostly depends on money and on what's available on the market. For pressurized tanks, we will use 6061 aluminium or steel. The thickness of the tank walls obviously depend on the internal pressure, but also on the diameter of the tank. See . For example, aluminium walls can be 2mm thick and 0.4m wide for a pressure up to 13 bar with no safety factor. For a 0.2m wide tank, the thickness can be 1mm for the same pressure, or twice the pressure for the same thickness. Cryogenic and also low boiling temperature liquids like nitrous oxide are persistently evaporating at ambient temperature. It's like having water at 100°C and providing always more heat to it. When the vapour pressure is high enough, and when tanks are solid enough too, the evaporation can reach equilibrium and the tank can contain a stable mix of liquid and gas at high pressure. This is the case for nitrous oxide at temperatures below 36.4°C, its critical temperature above which it turns all into gas, no matter what pressure is used. The issue then becomes the density of the mixture, which drops greatly. For LOX, the critical temperature is -118.59°C, and the critical pressure is 50.43 bar. There's no point in keeping it so much pressurized because it could just boil off at this temperature. Since the phase change occurs at a constant temperature, we can as well choose a temperature and a pressure at which the LOX density is high enough, but that's a trade-off with the evaporation rate. Since the temperature difference between inside and outside the tank is greater, even more heat is transferred to the LOX, and more evaporation is created. Tank insulation is then required to avoid venting all the propellant before actually using it (balloon or aircraft launch can take some time to get to the launch altitude). In the case of balloon or aircraft launches, the rocket stays filled with cryogenic fluids for a quite long time before being fired, with no possibility for refuelling. First on the ground after tank filling, during the final pre-flight verifications, then during the ascent to the rocket ignition altitude. The vehicle passes through different air layers with different temperatures and densities. A simple atmospheric model has been made (see File:ISA atmospheric model.c) and is used in order to calculate the heat transferred to the vehicle during the ascent, which is dominant over the heat transferred during the powered flight of the rocket. The ascent rate is approximated, as constant between some gross altitude levels. The evaporation rate can be calculated easily once the amount of heat provided by the surrounding air is known, using the heat of vaporization ΔHvap of the propellant, the insulation layer's U-value, temperatures and so on. The issue is that the amount of heat provided by air is very hard to calculate. It should be done using CFD, but can be approximated in some conditions. The convection heat transfer coefficient h is the key concern. See the heat transfer page for more information and results for the LOX tank given by the first rocket mass approximation. Cryogenic fuel tanks benefit from being insulated, which limits vaporization or even prevents boiling. A list of thermal conductivities is available on Wikipedia. PU foam is a simple solution, it can be sprayed at the desired thickness but may be hard to spray in very thin layers. Aerogel is the best existing insulation material and it has been used by Armadillo Aerospace (see below). Aerogel for cryogenic applications is currently available in 5mm or 10mm thick sheets. A more precise list of low conductivity materials is available here. Pumps and Engine fuel supply pipe and valve, tank pressure sensor, fill and drain pipes and valves. For a cryogenic fuel or a high vapour pressure fuel tank: pressure relief valve, venting valve. After Phil figured out the right pattern to make the gores for the spherical tanks, it went very well. the cost of the fastblock. It also sheds water fairly well. now it is just 3 psi and soon drops to 1 psi. We also insulated our test stand tank. XCOR uses Styrofoam, a type of polystyrene with a 33 mW/m.K thermal conductivity, to insulate their aluminium LOX tanks. This page was last modified on 29 December 2012, at 03:13.